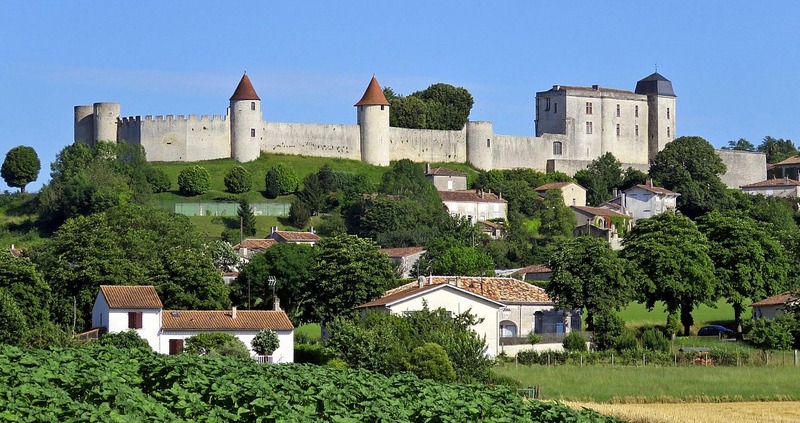 Perched on its hill, the medieval fortress of Villebois-Lavalette and its fortification flanked by six round towers, has a vast panoramic view of the surrounding country. Just below the castle, there is a magnificent 17th-century covered market hall which hosts a market every Saturday. 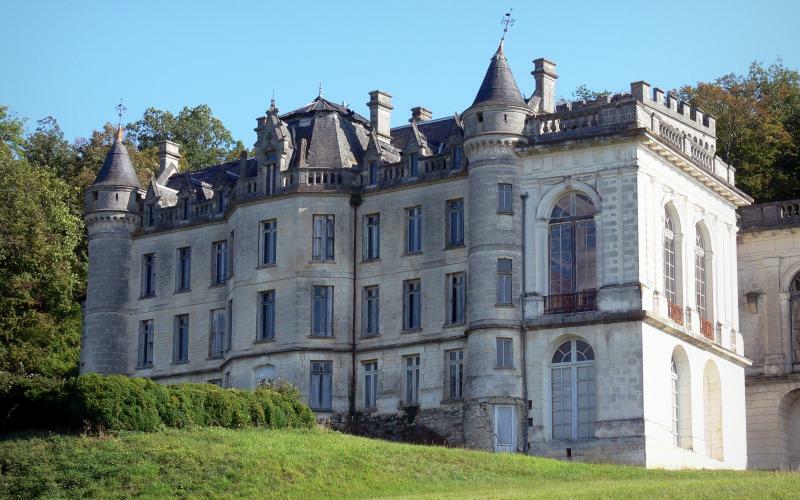 Known as the 'Versailles of Charente', the chateau's impressive 220m long façade in white limestone is being painstakingly restored by the commune and is well worth visiting. 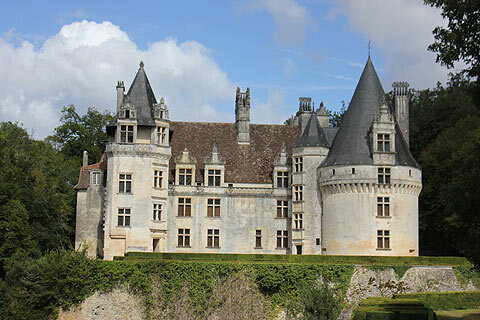 The chateau consists of two parts, the original 13th century fortress, whose 35m high octagonal keep affords superb views of the village and river below, and a richly furnished 16th century renaissance palace. Both castles are surrounded by sturdy fortified walls and there is a beautiful courtyard garden full of flowers and lined by trees. Guided tours in the Summer months from Monday to Friday at 5 pm, admission €4 euros per adult. 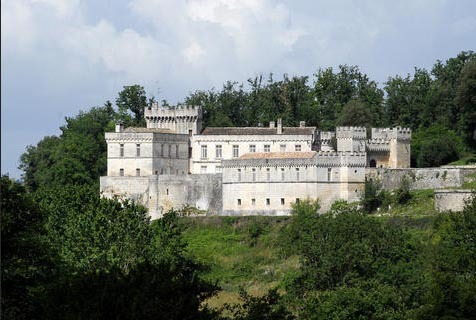 Less than 10km from Angouleme, the 14th century historic monument of Chateau de la Trancharde sits in a splendid position overlooking the Anguienne valley. Open all year round, admission per adult €6. Partly Renaissance and partly medieval in style, the 16th century Chateau de Puyguilhem was abandoned and pillaged in the 19th century, but was then acquired by the French state in 1939 and returned to its former glory after a long and painstaking restoration. Inside the castle you can see an impressive collection of furniture and tapestries, while outside, the grounds have also been attractively restored. 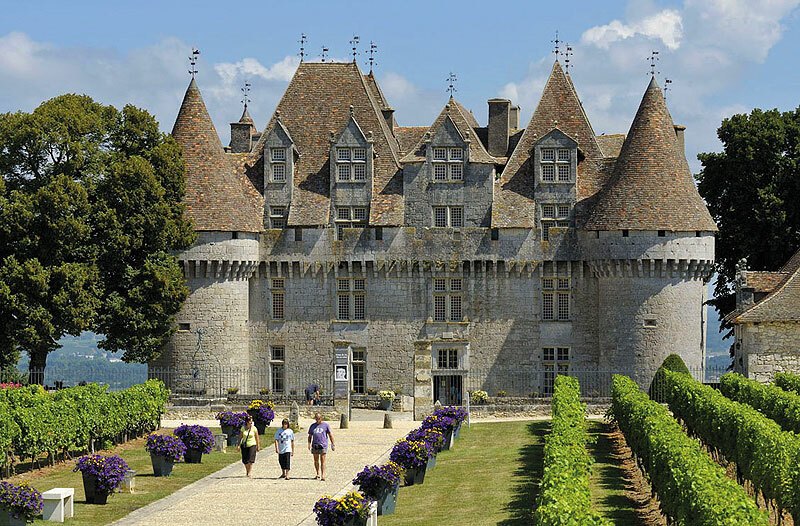 Known locally as the 'Pearl of the Angoumois', the Château of La Rochefoucauld was built in the 11th century has been owned by the same family for its entire history (since 980). 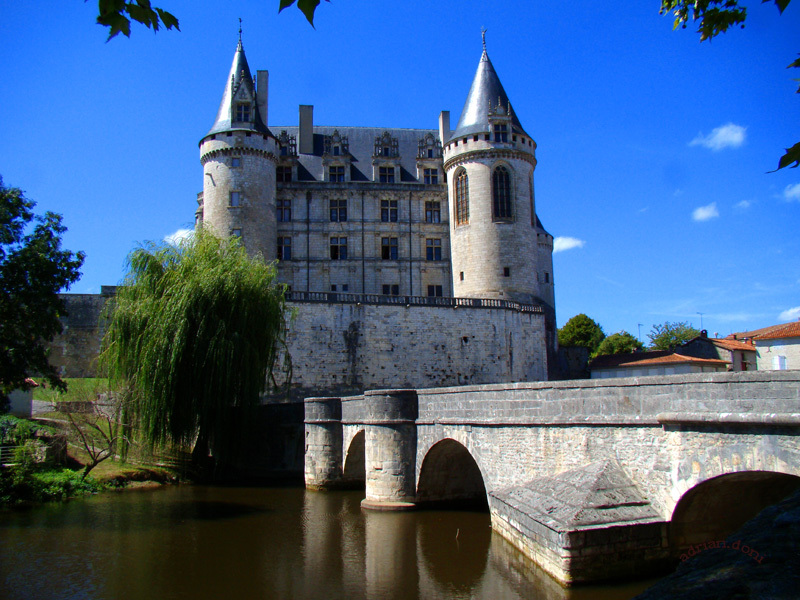 Of Renaissance style, this remarkable building magnificently overhangs the River Tardoire. The château features a square keep, a main courtyard, a spiral staircase, furnished rooms, a guards room, the boudoir of Marguerite de Valois, a library and a gothic chapel. The gardens around Chateau Rochefoucauld are also carefully maintained in the traditional French style and held in almost as much esteem as the castle itself. 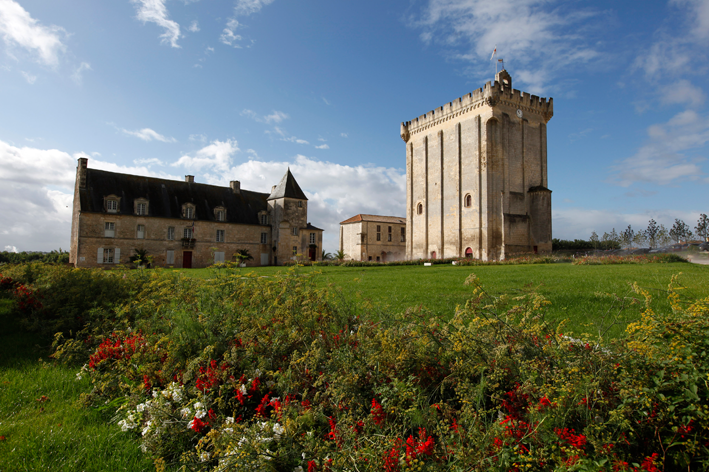 The Renaissance style Château de Monbazillac dates from the 16th century and sits high above the surrounding countryside, its large round turrets and mass of pointy roofs giving it something of a fairy tale appearance. But it is for its wine that Monbazillac is best known. 3500 hectares of vines produce one of the most highly reputed dessert wines in the world - tastings are available of course! Open every week-end from April to end of September. Everyday from June to beginning of September. 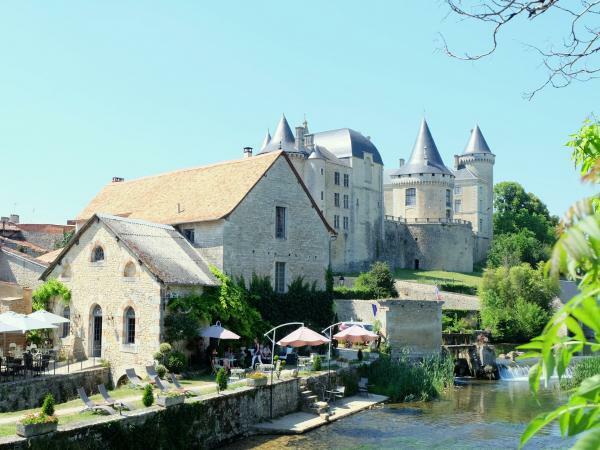 The castle is a very impressive site, with several imposing towers capped by conical slate roofs and dominating both Verteuil-sur-Charente itself and the river below. 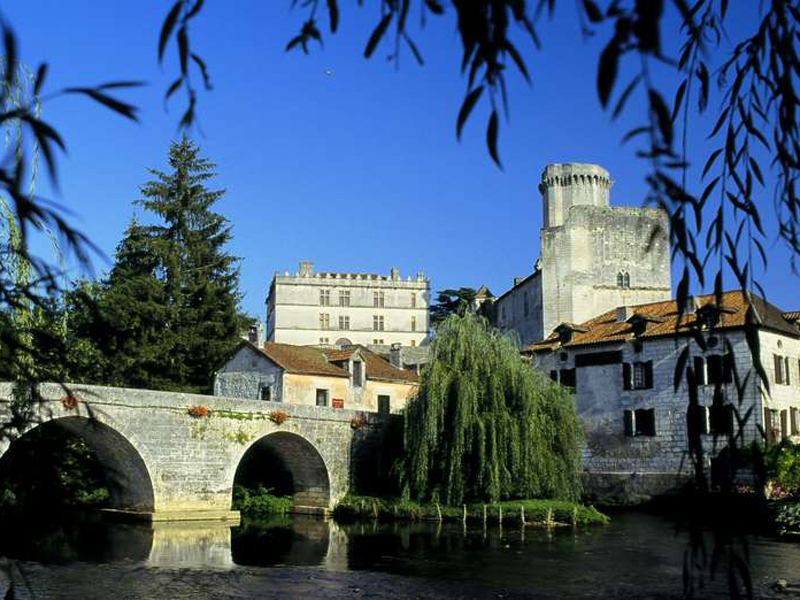 It is generally considered to be one of the finest castles in the Charente region. Built by the locally important Rochefoucauld family the castle dates from the 15th century, having largely replaced an earlier 12th century castle in the same location. The square castle keep is the main part of the original medieval castle still to be seen, while the round towers with their conical roofs are the 15th century additions. Completed in 1187 following the destruction of the original by Richard the Lion Heart, the tower is an impressive rectangular building standing 30 metres tall with walls up to 4 metres thick. From its top, the view of the old town and the Seugne valley is breathtaking. One of the most impressive castles in the Dordogne, this medieval fortress sits high on a promentory overlooking the Auvézère Valley and Hautefort village. Apart from the splendours of the building itself, Chateau de Hautefort's impressive interior is richly furnished, and outside there are French formal gardens and an English-style park. 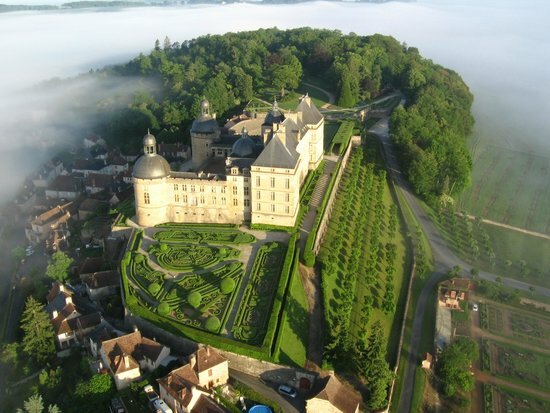 It is one of the most popular and visited chateaux in the region.